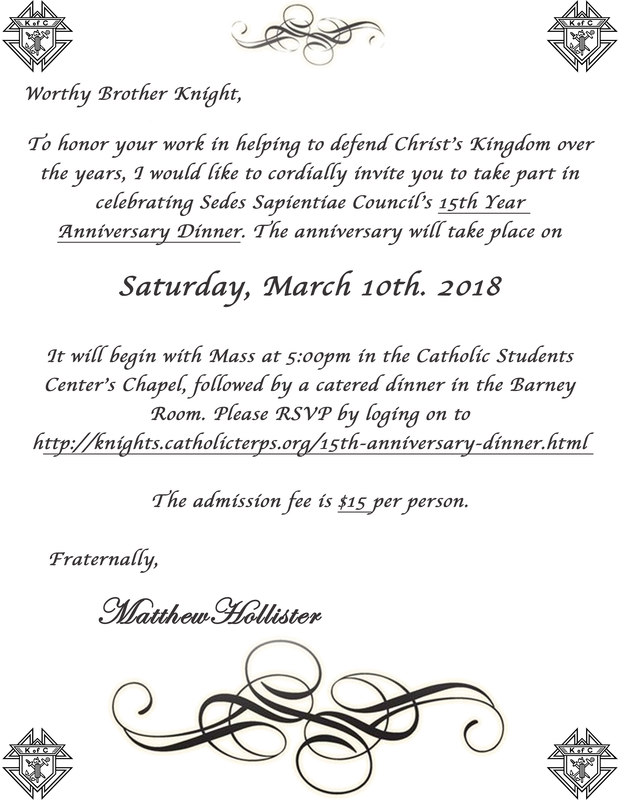 In order to honor our hard work to grow Christ’s Kingdom at the University of Maryland since the Council’s founding in 2003, we would like to invite you to join us in celebrating Sedes Sapientiae Council 13295’s 15th year anniversary on Saturday, March 10th, 2018. Our celebration will begin with Mass at 5:00pm in the Catholic Student Center’s Chapel of Christ the Divine Teacher, followed by a catered dinner in the Barney Room! A $15 donation per attendee is required for RSVP. ​Please enter $15 after clicking the button below to register!